Eddy is my brother, not by something as accidental as blood, but something much stronger – by choice. He’s always been a solid friend ever since I met him in 2008. 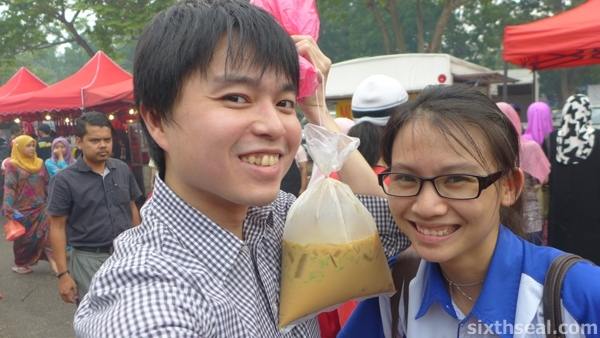 He’s usually the one picking me up when I fly back to Sibu and this time was no exception. His wife Jona is a great cook and I went over for dinner the other day. 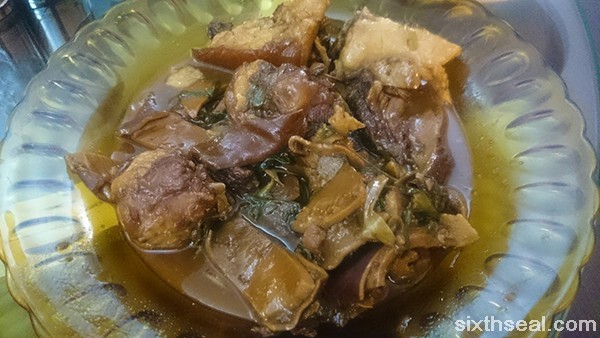 This is ikan terubok (also known as toli shad or Chinese herring). 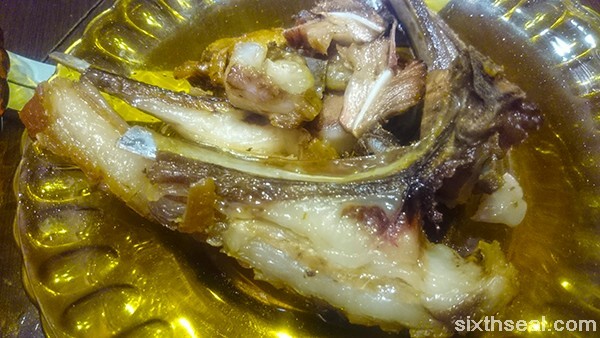 It’s a very popular fish in Sarawak. 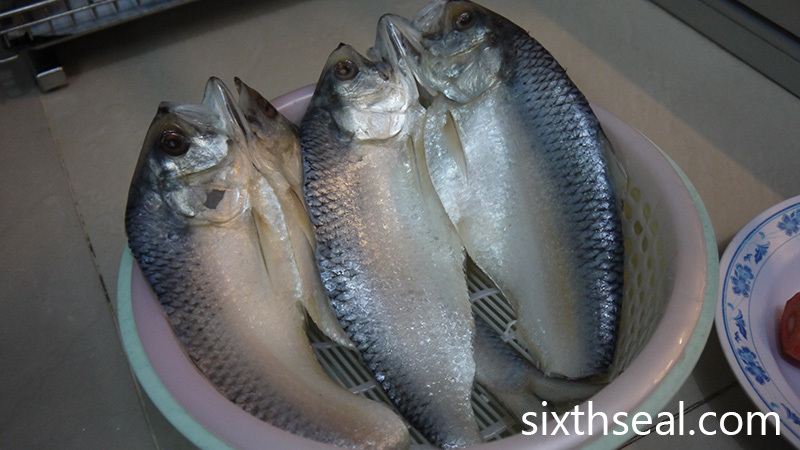 Toli shad is only available here and there are two varieties – the fresh ones and the dried + salted version. You can see the distinctive pattern here coz the scales are not removed (!!!). 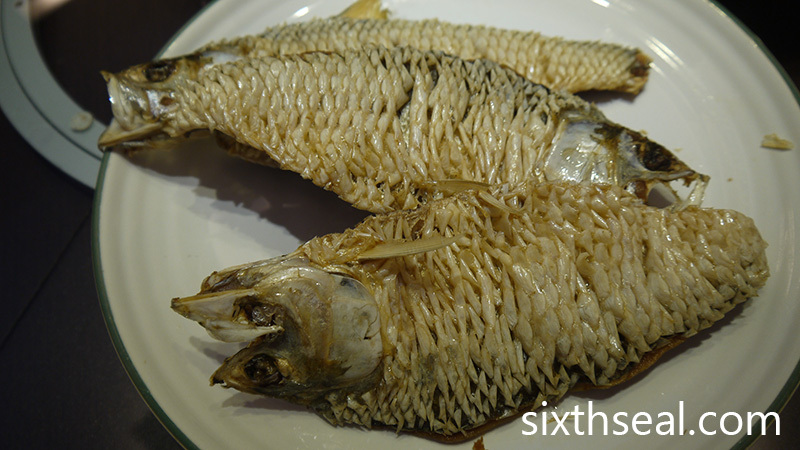 You actually deep fry the entire fish and it comes out very crunchy so you can eat the scales and bones. I thought that was very intriguing – I’ve never had it this way before and wanted to get some for my better half to try. It’s sooooo delicious. 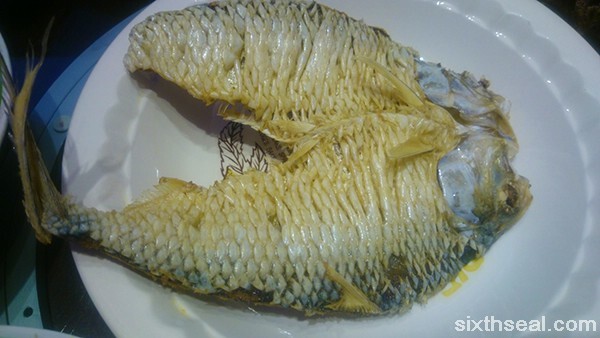 You can only get this fish in Kuching though. 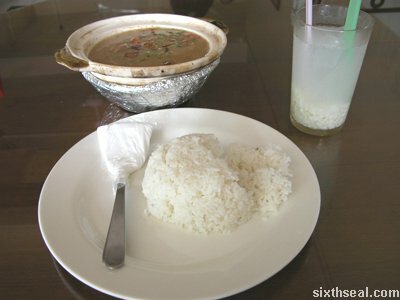 I didn’t eat this until after I finished all my rice coz I didn’t grow up with soup so it’s not essential to my diet. 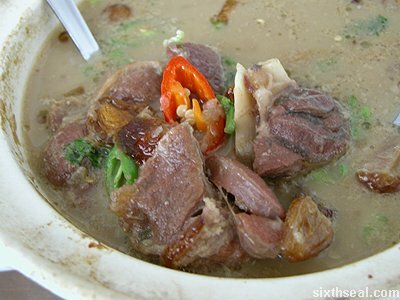 I know some cultures like Foochow and Cantonese which accords soup a very important (even essential) place on the dinner table. 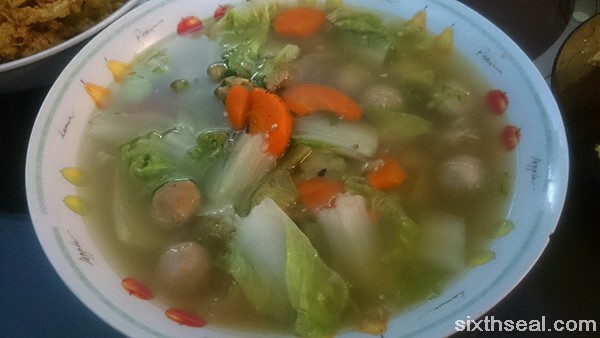 I found the soup to be very flavorful from the meatballs and the texture of the soft vegetables (from boiling) to be quite heartening. This is not for the picky eater but I love it. 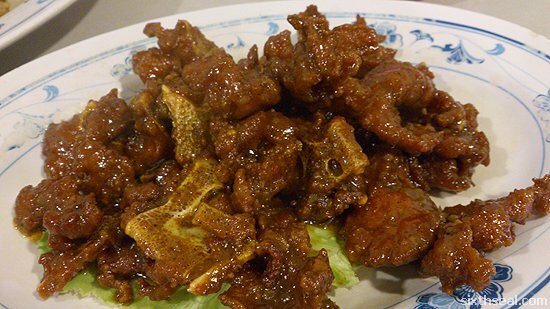 The hog maw is from Golden Happiness Restaurant. 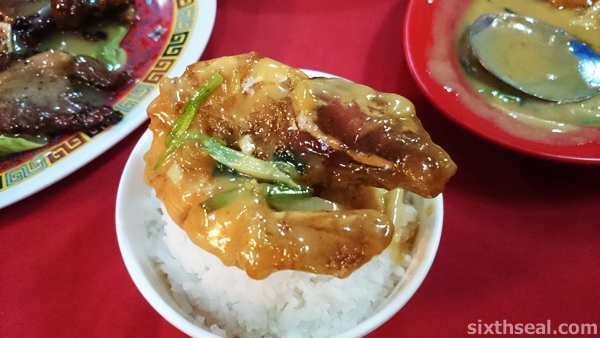 I’ve eaten the same dish before during Chinese New Year and they do it really well. 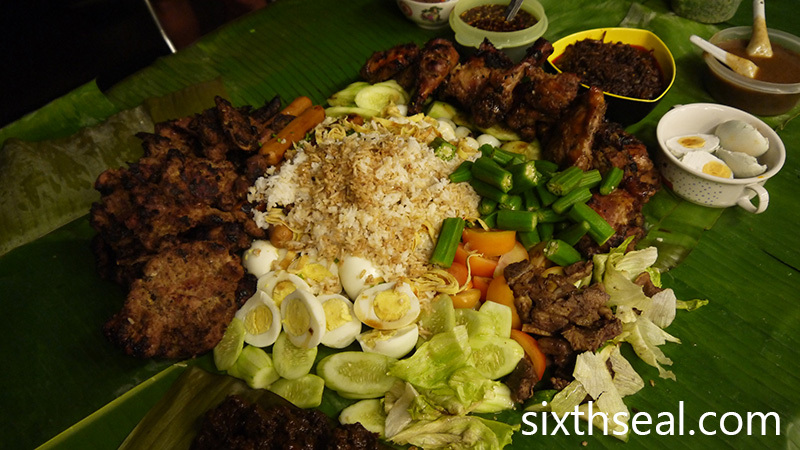 It’s a mixture of organs – pig tail, pig ears, and duck. This is the healthiest item for the night. 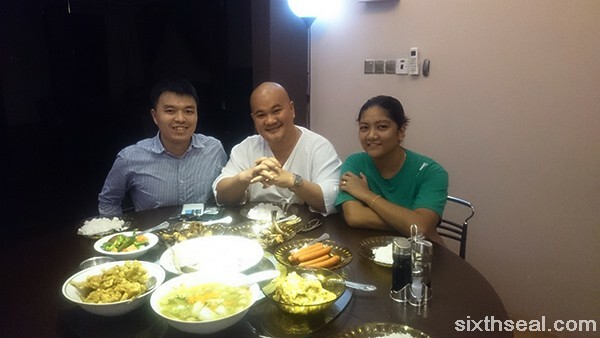 Eddy has two Indonesian maids and he treats them really well. 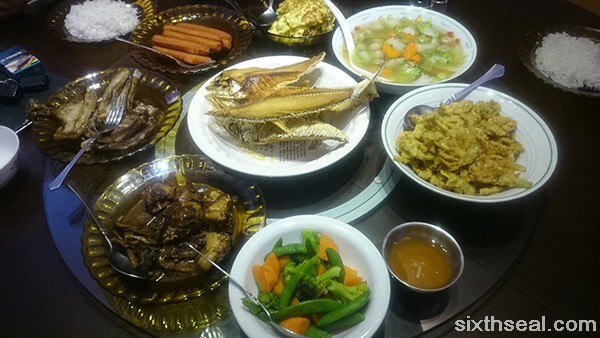 We all eat together during buka puasa (the breaking of fast during the month of Ramadan for them, who are Muslims). This is something new for me as well. 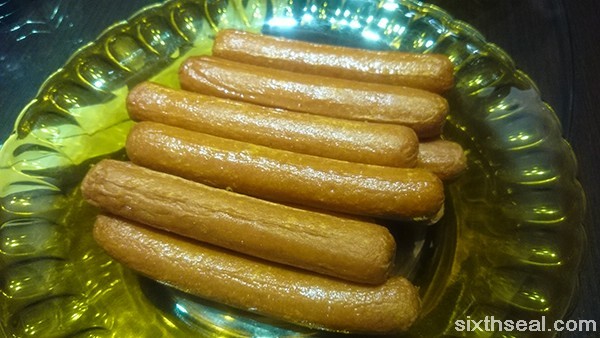 I was quite hungry when I woke up (fell asleep at his place coz I’ve been working late nights during this trip) and had one of the otak-otak sausages before dinner. 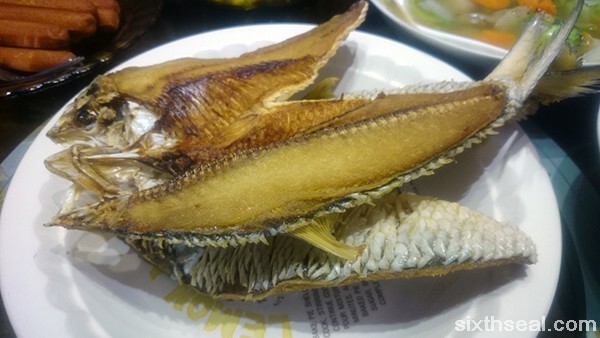 It’s very spicy and really tastes like otak-otak, although it’s not made of fish. I’m not sure what kind of protein is inside, let’s just say it’s a lip-smacking package of mystery meat in tube form. A comfort food that most people has grown up with. 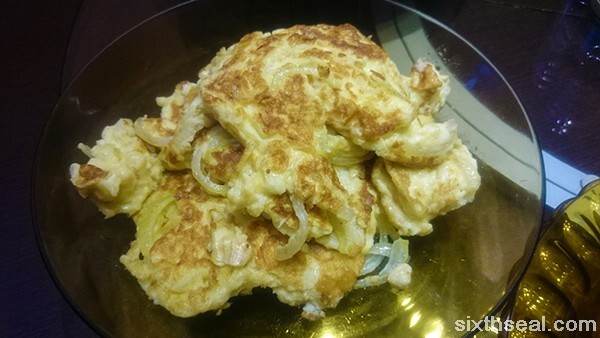 It’s large Bombay onions chopped and fried with eggs. 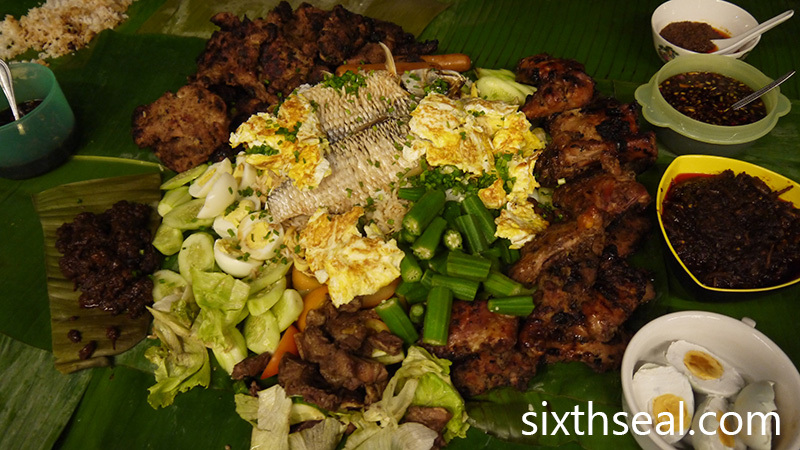 The sweetness from the onions make this a very familiar and welcome addition to the meal. 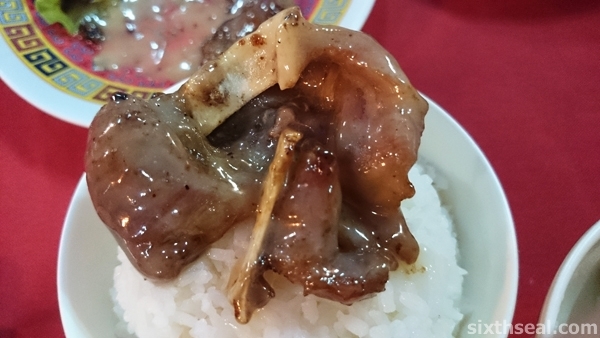 I love lamb chops. My mom used to cook them for us when we she was still alive and all of our family like the taste of lamb. I’m particularly fond of unrendered lamb fat – it’s strong tasting and gamey to a lot of people but these very characteristics are the same reason I love the fatty parts. Bitter gourd chips! 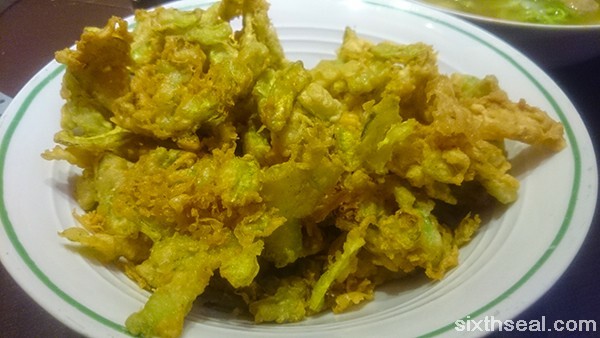 This is thinly sliced bitter gourd that’s been battered and fried. 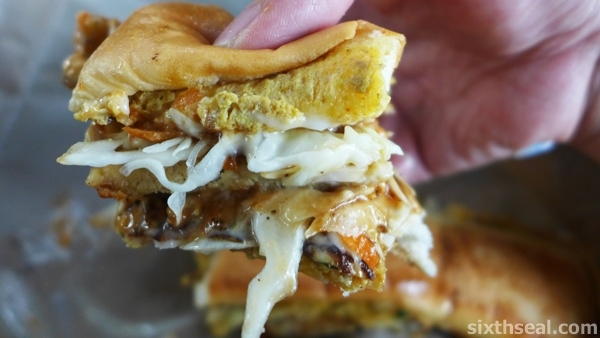 It’s crunchy and slightly bitter – pure awesome! I’ve also never had it this way, that’s why I always like eating at Eddy’s house. Jona always comes out with food that I don’t eat often (or at all) so it’s a pleasure to sample these new dishes. It was a delightful dinner. 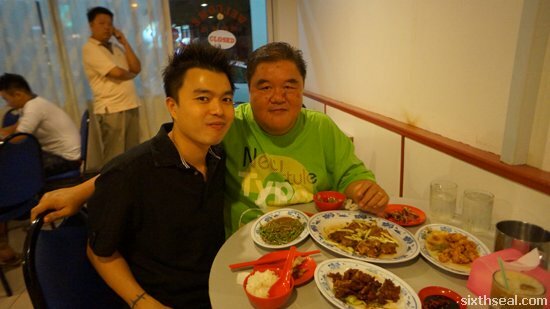 I’ve always enjoyed eating at Eddy’s place due to the splendid cooking. I tend to overeat and stuff myself but it’s worth it, coz I hardly ever eat here unless I’m back home. 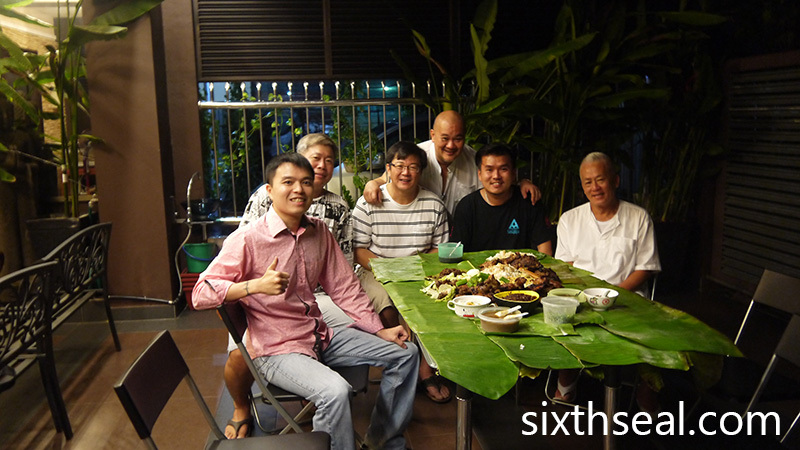 There’s always something interesting on the table and the fare is better than most restaurants out there. I haven’t been to Ruby Restaurant in quite a long time. My dad and I wanted to go on Wednesday but that was their off day so we had to go somewhere else instead. However, I was quite determined to head over since I’ve enjoyed their food a lot and so I went with my dad again and found them open. 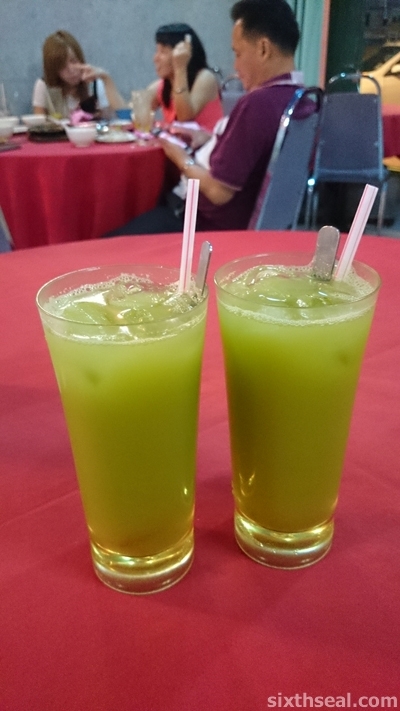 We both ordered kedondong juice. 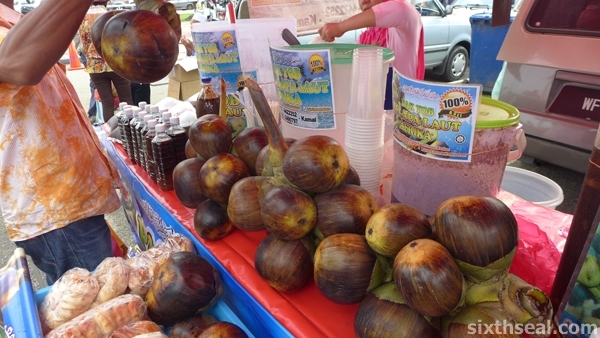 Kedondong is a tropical fruit also known as ambarella (Spondias dulcis) and it’s makes for a tart and acidic drink. I wanted to have their creamy butter prawns and the owner told me they have the large prawns that I like so I jumped at the chance to have that. 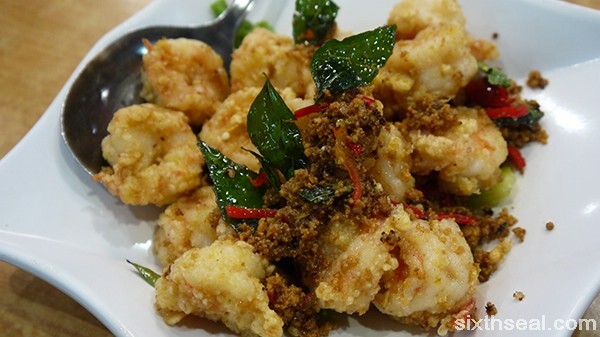 This seems to be big white prawns instead of big head prawns but delicious regardless – the prawns are so crunchy you can eat them, shells and all but still soft and moist inside. 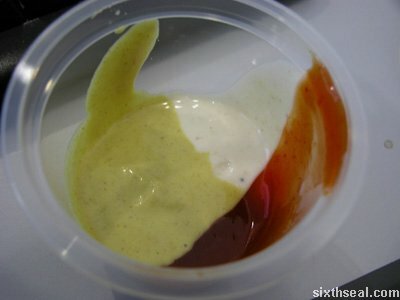 I love their butter sauce – it’s so rich and appetizing. 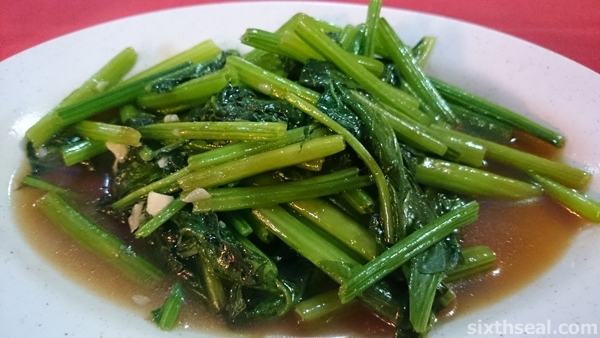 My dad also ordered a vegetable dish – puo chai cooked in Chinese white wine. I was quite surprised at how good it tasted. 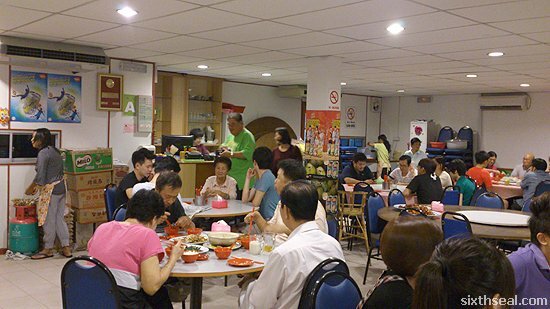 Ruby Restaurant used to be a favorite of mine before I switched to Ming Mei Shi – which serves a more KL-style dai chow. I like the localized Ruby Restaurant better now. This is delicious, not overcooked, with a hint of raw Chinese white wine. The other dish we had was recommended by the owner when I asked for something new. 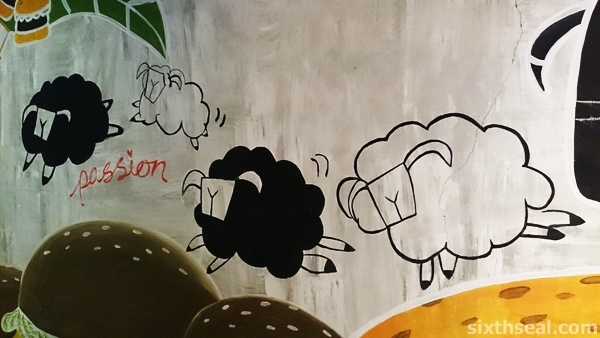 She suggested sour mayonnaise lamb. I asked her what the acidic component is and she *pretended* not to hear me twice before smiling and said it’s a trade secret. 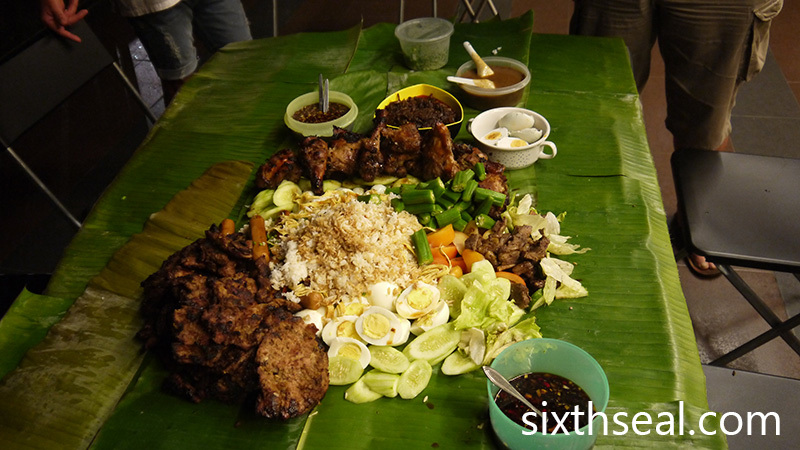 That definitely sounded promising and even my dad loved this – the addition of citrus or vinegar brightens up this otherwise cloying dish and the lamb isn’t overtly gamey too. 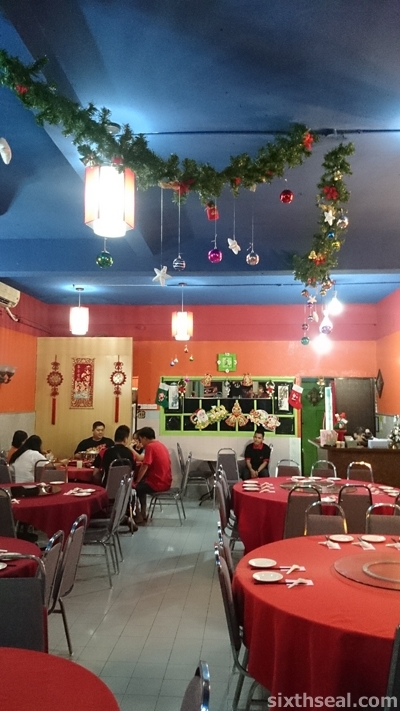 The bill was quite reasonable – the prawn dish *alone* came up to RM 40 due to the two large prawns but the lamb and vegetables are surprisingly affordable. The two of us polished off everything in sight! My dad mentioned that everything they served tasted delicious and I have to agree. We had just come from a terrible dinner the night before and it’s nice to revisit an old favorite like Ruby Restaurant again. 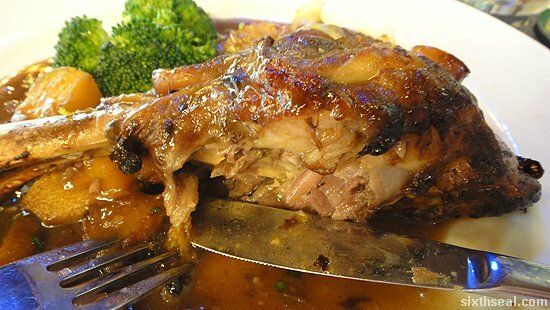 It’s even better when you find that the standards have increased and not dropped – Ruby Restaurant is truly a gem! Bert’s Jr. Gourmet Burgers is just a stone throw away from where I live but I’ve never eaten there, despite going to a lot of different places during the “burger craze”. We were craving burgers over the long weekend and since a lot of shops weren’t open, we decided to eat here. The different thing about Bert’s Junior is that they *don’t* serve pork – so don’t expect a nice juicy oink patty coz they’re a halal outlet. 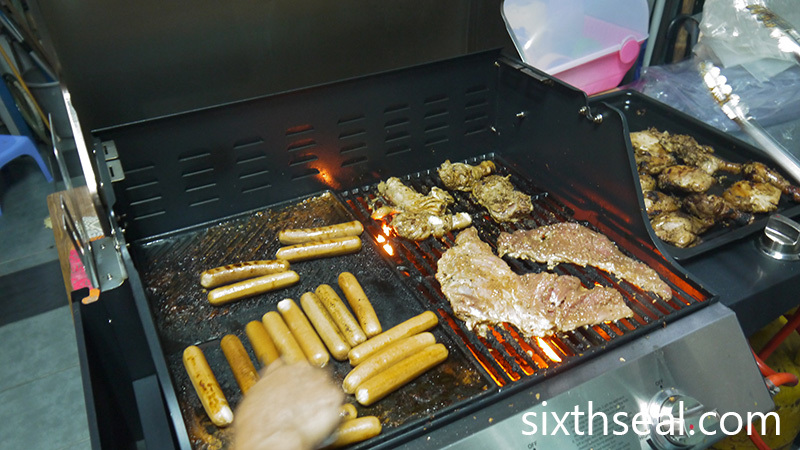 I am wary of places like this, since some Muslims mistake myoglobin in cooked meat (the juices in a steak when it’s not rested properly) for blood, and since since blood is prohibited, a lot of halal steak houses and burger joints have very little in the way of customization – the meat is only served well-done e.g. you can’t order a blue steak or have it medium rare. Thus, I steered clear of the steak offerings (Bert’s Jr offers that on their menu too) and went in for the burgers. 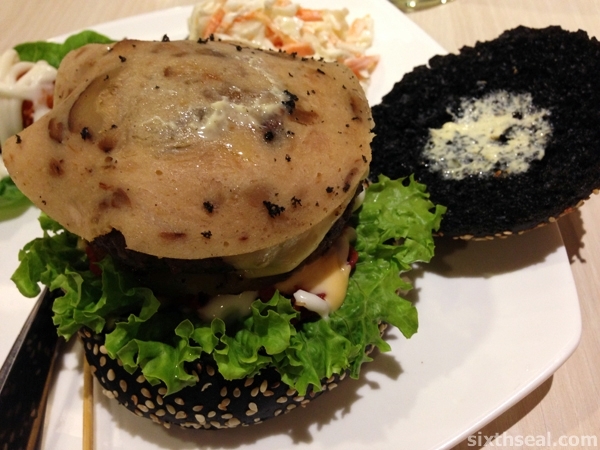 I asked for a recommendation and got Dark Vader (char-broiled mozzarella infused Australian beef patty topped with beef bologna cold cut, cheddar cheese, shiitake mushroom, green leaves, peeled tomato, caramelized onions) and Baa Baa Black Sheep. Bert Junior has burgers available in both small (100 gram) and regular (200 gram) patty sizes and I went for the larger one for my order. 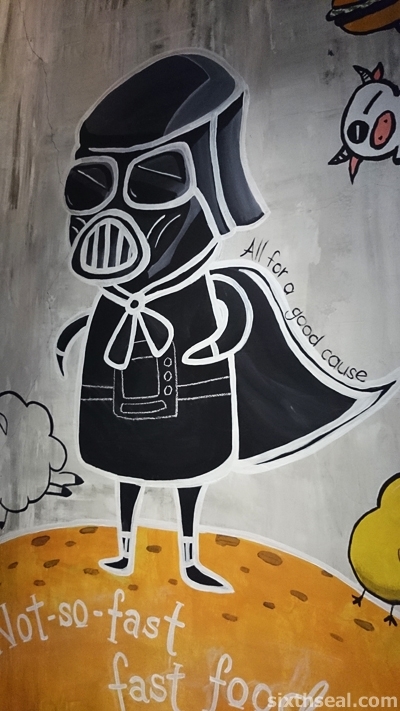 My better half went for a chicken burger since she doesn’t really like beef (Dark Vader) or lamb (Baa Baa Black Sheep). 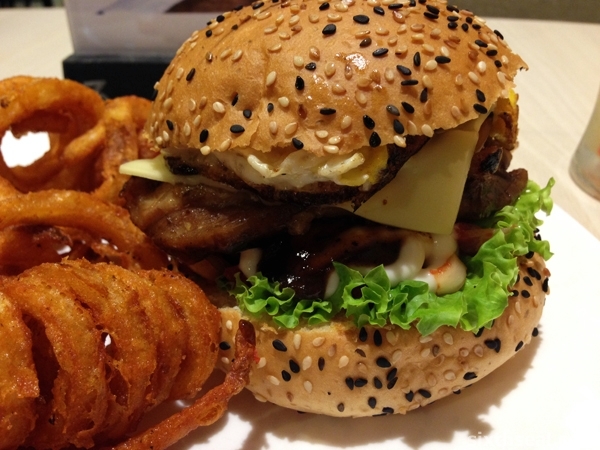 The burgers can also be made into a meal for RM 5 more – affording you a drink and a side (curly fries, French fries or croquette with coleslaw). It’s cheaper than most premium burger outlets in town. I honestly can’t say I enjoyed my burger. I thought the combination of the lamb patty with the tomato salsa (which tasted more like a poorly executed Marinara sauce) was strange – it seems like the ultra strong tomato salsa is meant to cover the gamey taste of the lamb. I like the taste of lamb so I didn’t enjoy the overwhelming taste of tomatoes, which was ALL I could taste after a while. I did like my side of croquette and coleslaw though – the latter was very refreshing. 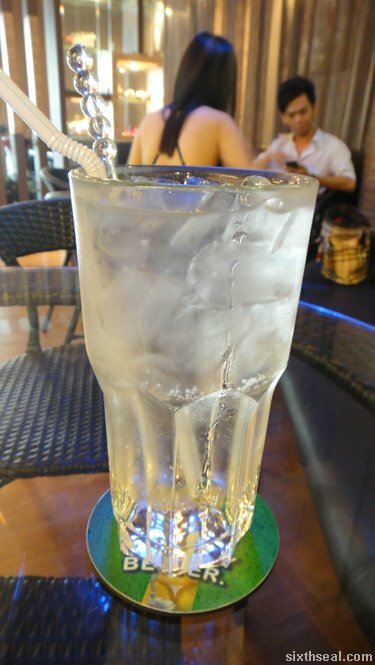 This is the most ordered item, according to the waitress. My dear went for the chicken option and she commented that the chicken thigh was rather dry. She did finish her burger though, but we couldn’t make a dent in the curly fries. I had a bite and thought it was mediocre but I do like the incorporation of a cold cut from the deli in their burgers. 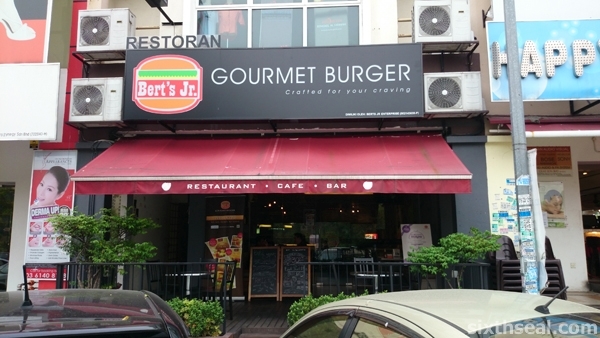 I felt that our trip to Bert’s Jr. Gourmet Burgers was rather disappointing. 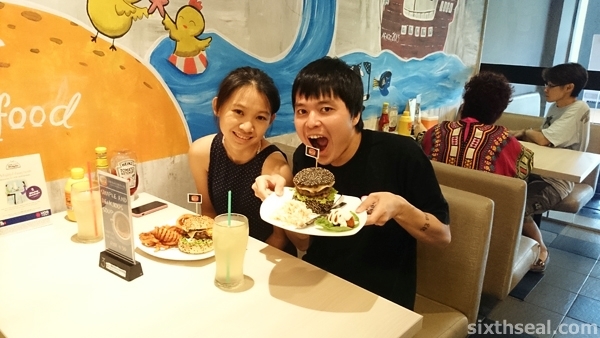 The burgers we ordered were really underwhelming compared to other burger joints in town. However, the service was friendly and efficient and they also have a steamed cheeseburger on their menu, which I am keen to try next time. 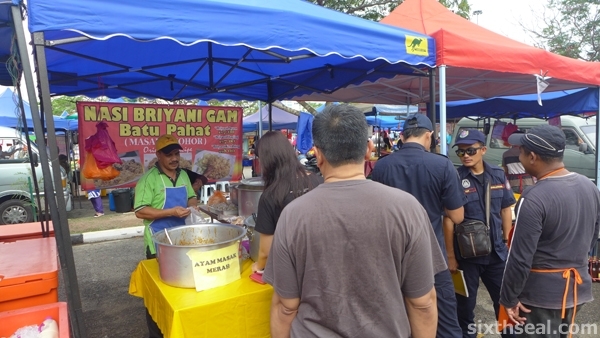 Pasar Ramadan Shah Alam – briyani gam, Roti John and enforcement officers! 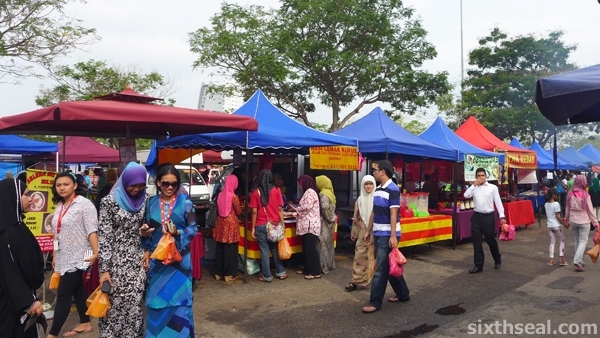 The Pasar Ramadan in Stadium Shah Alam is reportedly the biggest food bazaar in Malaysia. 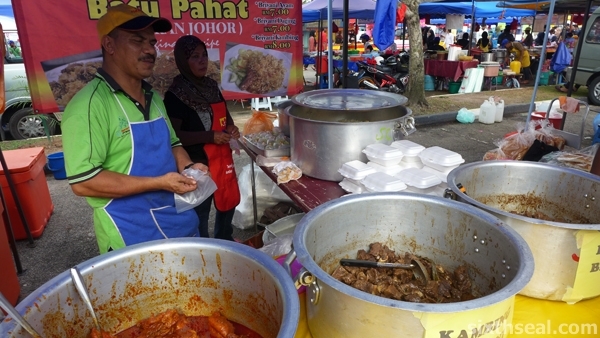 It opens once a year during the holy month (for Muslims) of Ramadan with various vendors from established shops to home cooks offering all sorts of delicious fare for people to buy and eat when they break their fast. 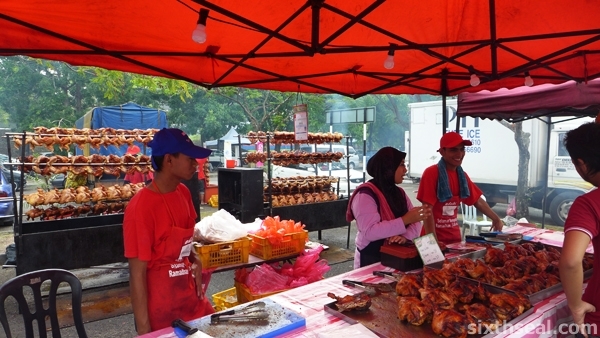 There’s a big stall with lots of BBQ chicken on spits turning over a charcoal fire offering just one item – ayam golek. 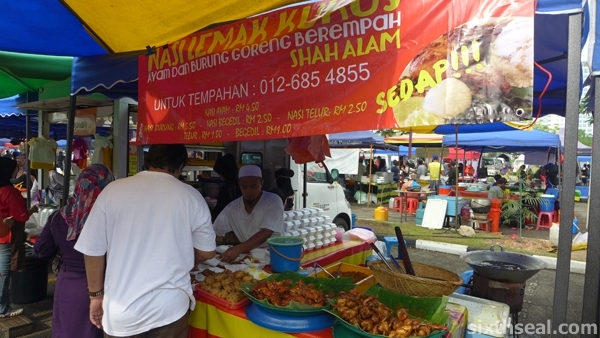 Ayam golek basically translates to “spun chicken” (I think) – and this particular stall sells it for RM 19 per chicken or RM 10 for half. 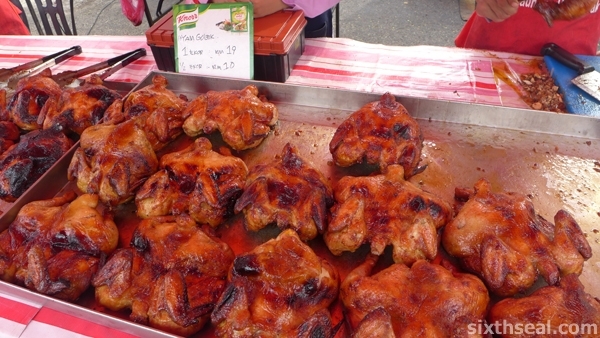 The chicken is marinated in madu (honey) and rempah (spices) and it’s one of the most popular stalls there. It tastes really good! 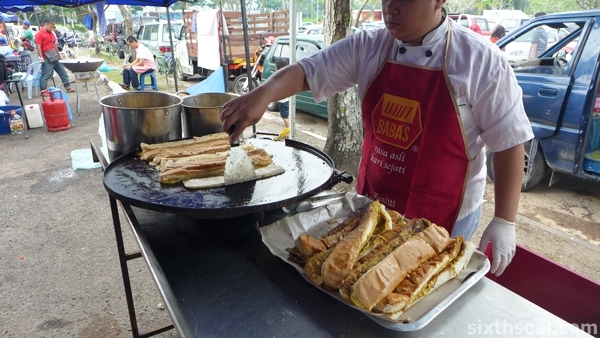 Roti John stalls are also very popular. 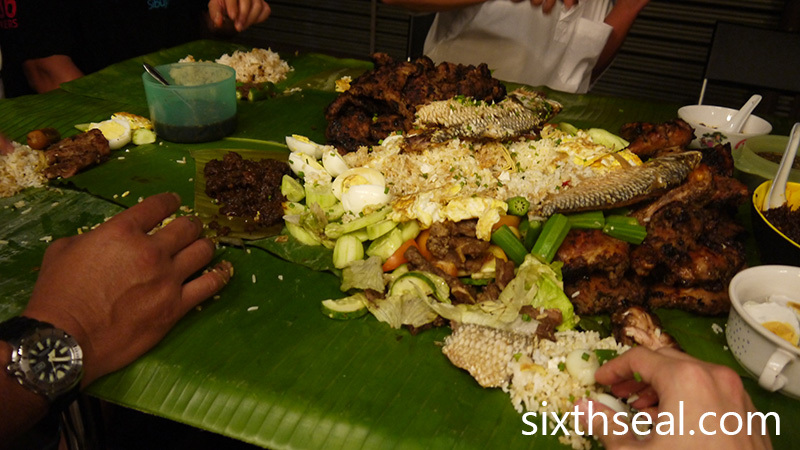 It’s basically a long loaf of bread stuffed with various ingredients – anything from beef to seafood. 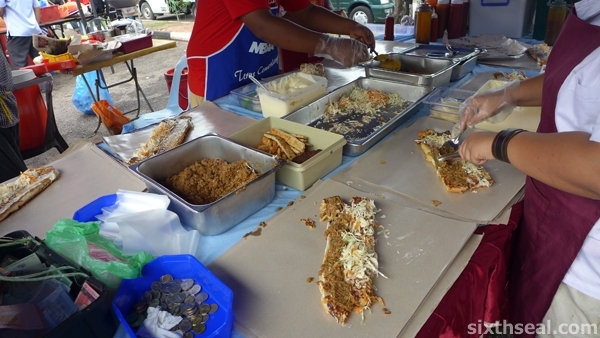 I found one called Papa John with a fearsome queue – the Roti John is done up like an assembly line with a cook at the back and the French loaf sized sandwiches were flying off the table as soon as they got there. 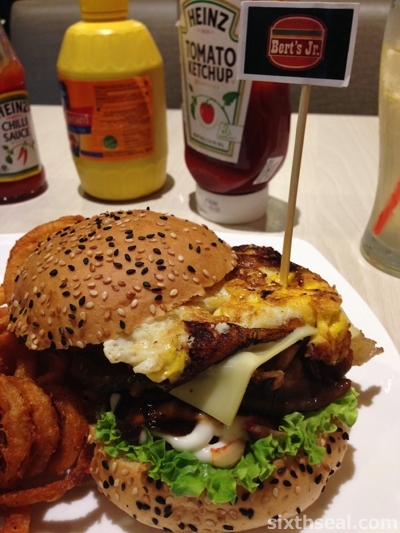 We got the aptly named Extravaganza for RM 8. The regular ones are half the price but this contains generous slices of oblong burgers in addition to the minced meat (you can choose chicken or beef) that comes with the normal ones. 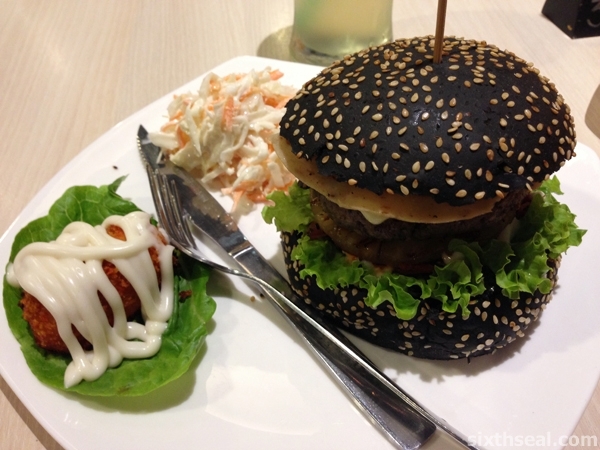 It’s made a lot like a large Ramly burger. 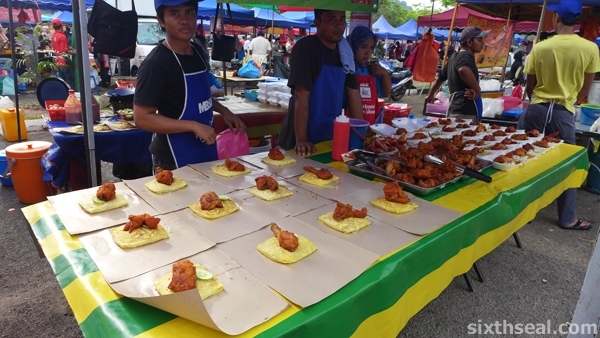 Nasi Briyani Gam are also very popular with lots of stalls selling this special that hails from Batu Pahat, Johor. 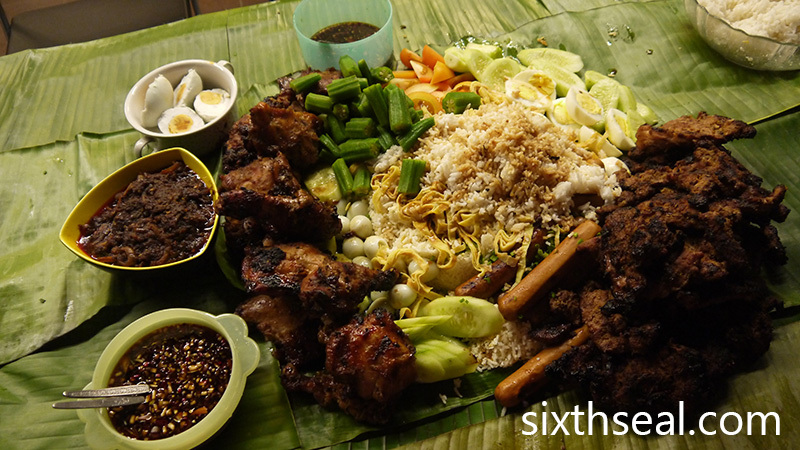 It’s a type of spiced rice that’s strained with a muslin cloth and served with chicken, lamb or beef. 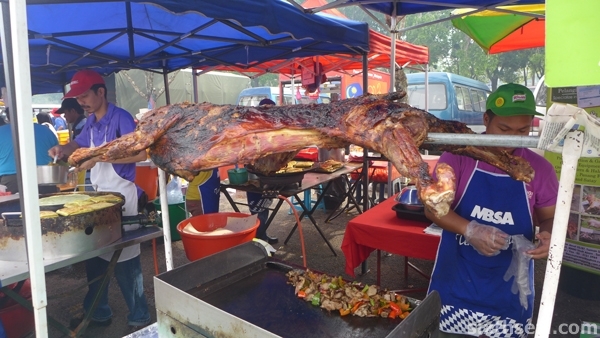 The kambing (lamb) is the best and goes for RM 8. 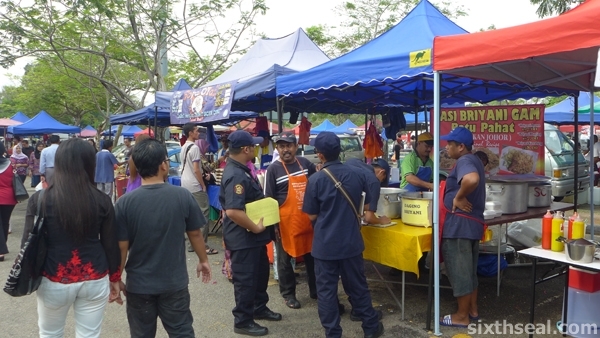 Funny thing about this stall is that it has no licence and *enforcement officers* were there giving them the good news. 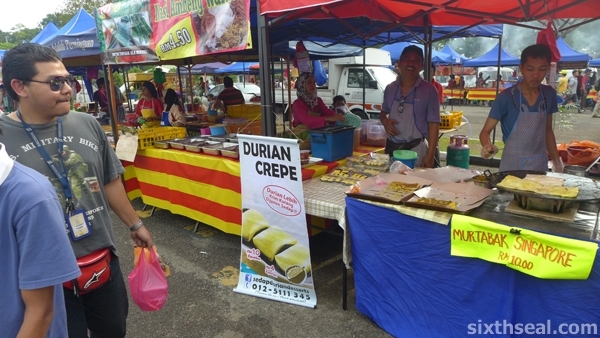 There’s also a stall selling durian crepes and Murtabak Singapore (a type of filled roti canai). It’s RM 10 for 6 pillows and it tasted really good. 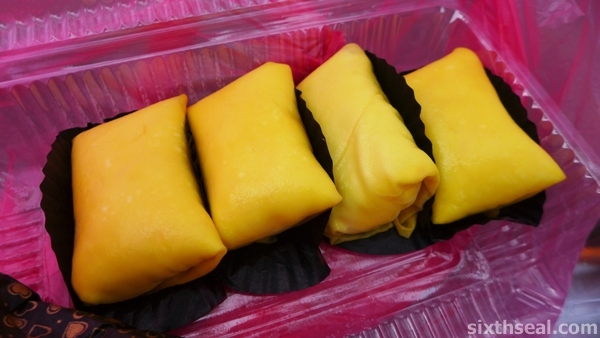 It’s supposed to be made with D24 durians. It didn’t even last the trip home, we ate the last ones in the car. It’s supposed to be kept cold and it’s yummy when eaten chilled. 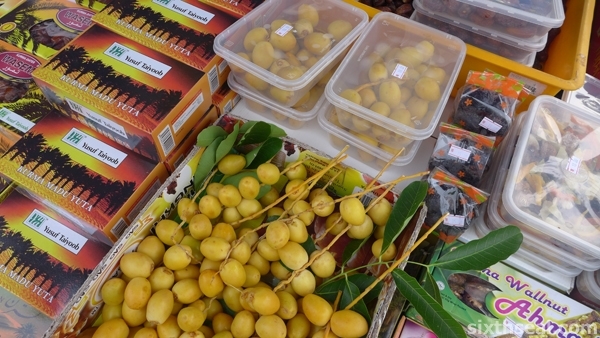 I also bought some fresh dates on a branch (quite expensive though) on a specialty date store that also sells various Iranian dates. 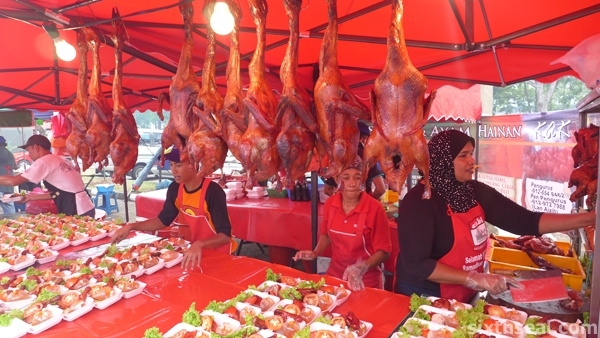 There’s also a stall that sells smoked duck – lots of the birds were hanging from a hook. 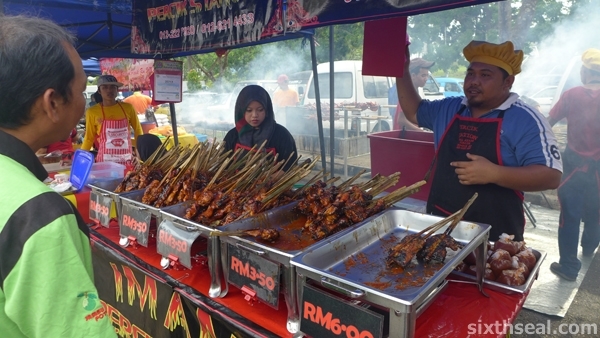 Ayam percik is another seasonal must have and my dear got a skewer for RM 3.50. 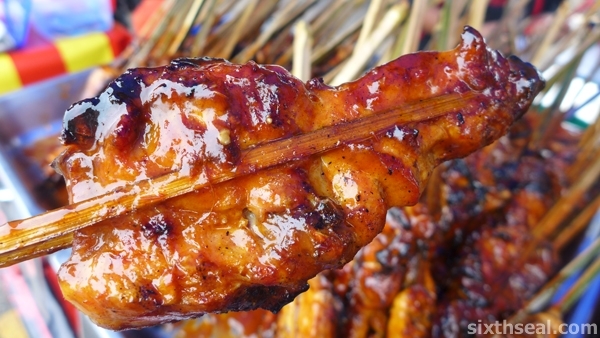 It’s marinated and chicken grilled over a charcoal fire with a unique sauce but it tasted horrible coz one side was burnt. I chose that one coz I thought it’ll impart some nice caramelization (like our honey spiced chicken) but it ended up being tough and bitter instead. I did like the deep fried quail though. 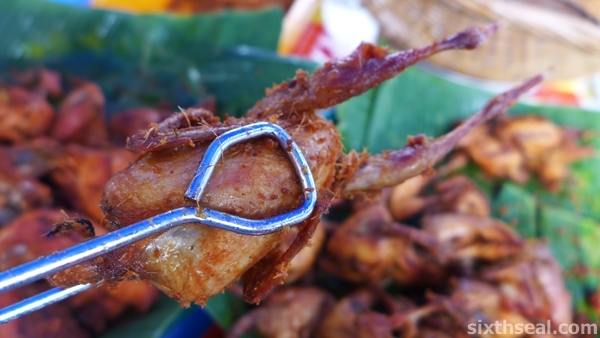 The deep fried quail is simply called called burung goreng (fried bird) and just cost RM 4.50 for an *entire quail*! 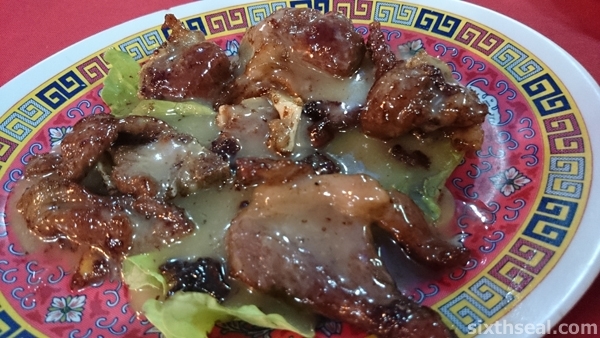 It’s small but delicious, if you like quail meat and it’s served with spices too. 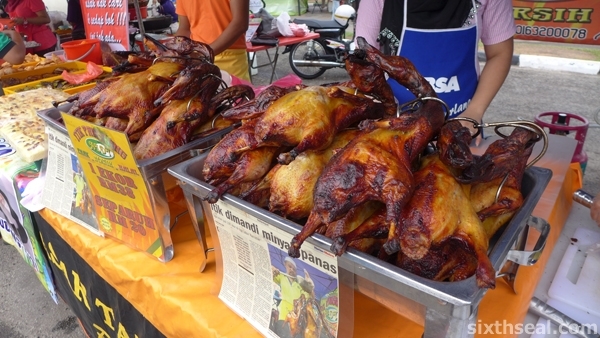 The other good buy we made was at the stall that sells itik mandi minyak panas (duck bathing in hot oil). It’s apparently very famous – they had a bunch of articles in papers featuring the duck. 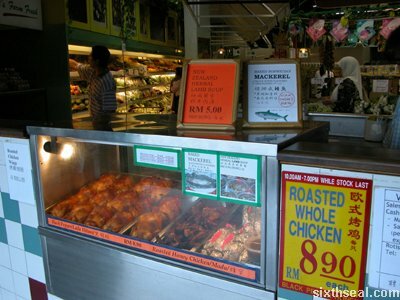 The duck cost RM 38 each, which is about right (ducks cost about twice that of chicken) but we had bought so much stuff that we couldn’t even manage half. 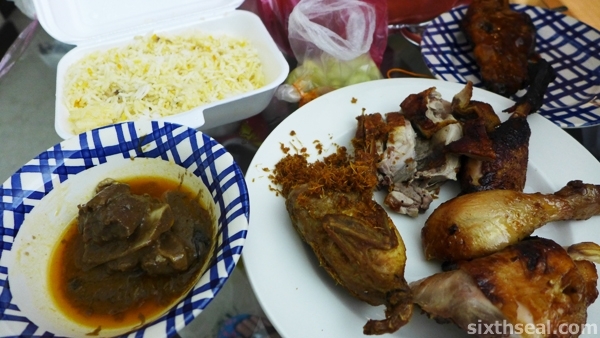 The man was kind enough to sell us a quarter (chose the duck leg portion) for RM 10. I thought duck bathing in hot oil is a really funny and quirky name too and the guy manning the counter was very educated and spoke English with an Oxford accent! 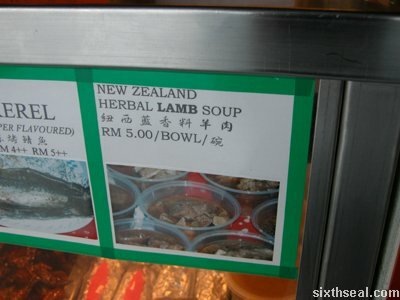 There are ready made meals too but we didn’t buy those coz we already had a nasi briyani gam kambing. Of course, being Ramadan, drinks are big at the bazaar too (since the fasting Muslims do this month includes not drinking during daylight hours). 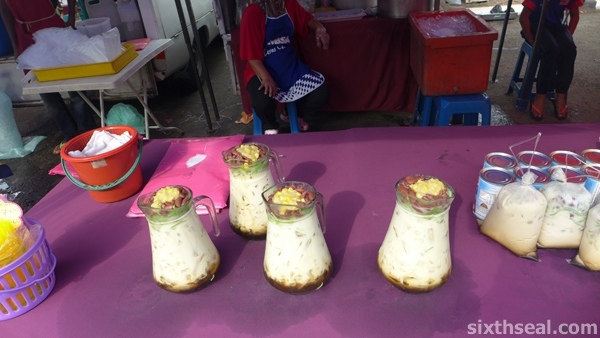 Sea coconut drinks are popular as well as the ubiquitous cendol. 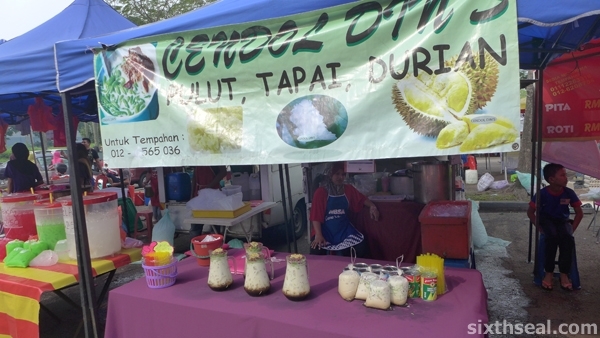 I couldn’t resist this cendol stall that sells the shaved ice with palm sugar concoctions by the jug. 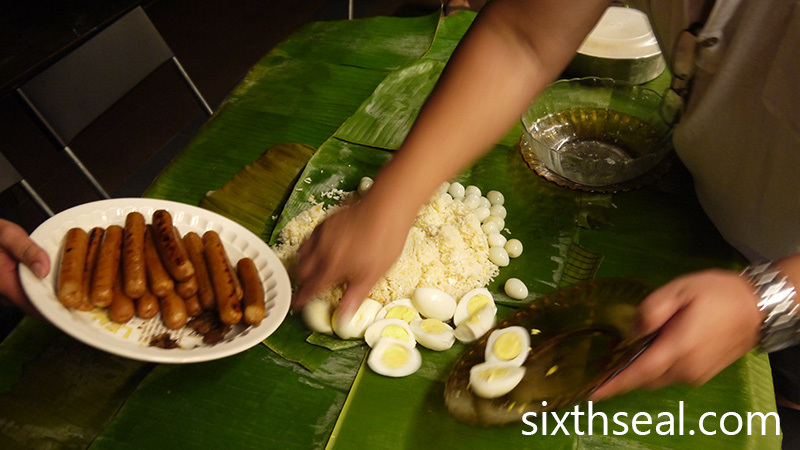 There’s various toppings you can make too – tapai (fermented rice), pulut (glutinous rice) and durian. 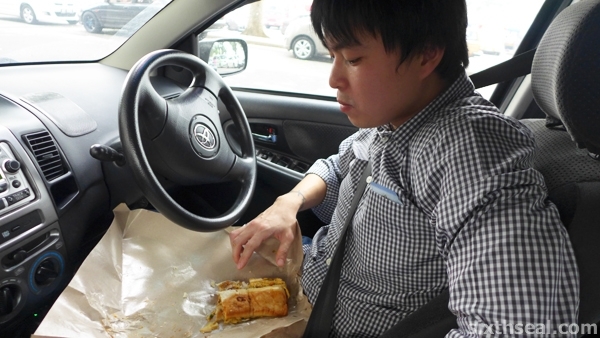 There was a massive traffic jam going back coz of all the people rushing back to break fast so we ended up eating the Roti John in the car in anticipation of the long drive. We had a veritable feast when we got back! My dear promptly got food poisoning though and had to sit on the toilet a couple of hours after that. I was fine though, it’s the luck of the draw I guess, some of the food has been sitting there for hours. 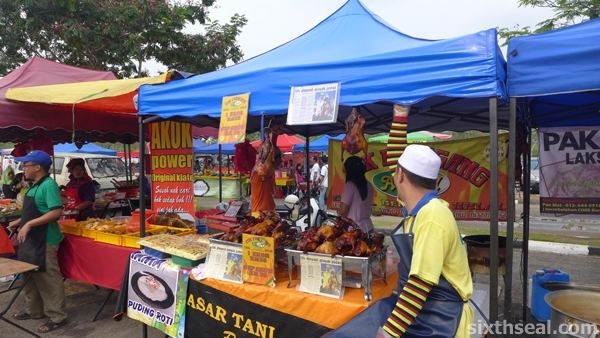 Pasar Ramadan Stadium Shah Alam is very congested starting from 6 pm onwards and it opens at 3-4 pm. 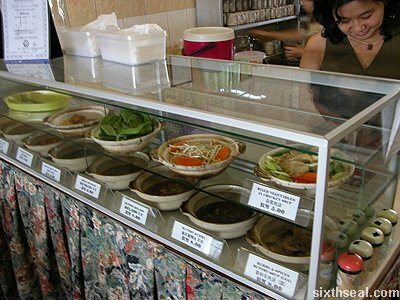 I still love going there though – it’s always very interesting to get different dishes to go at the food bazaar to eat at home. I spent a lot there coz I didn’t realize how the little things would all add up! 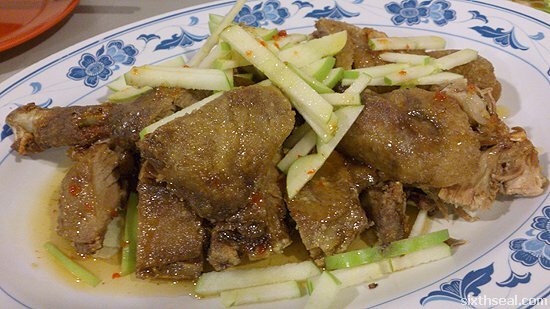 I’ve never heard of an apple duck before – the waitress taking the order assured us it was a very popular dish and thus, we swapped one of the meat orders (black pepper beef) with this menu item. We were at Nice House Restaurant – me and Arthur originally wanted to go to Cafe Ind for some fusion Indonesian and Indian food, but it was closed. Thus, we headed over to a place which serves a gigantic roti canai that I wanted to try but that was closed too. 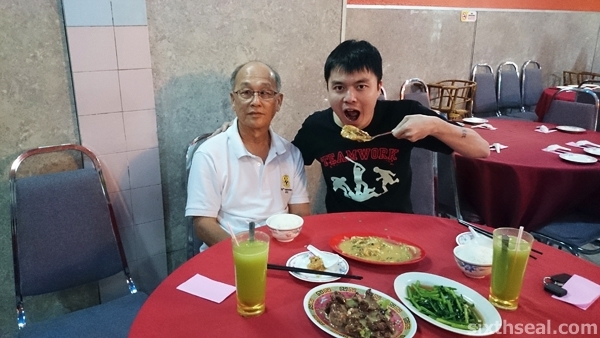 We ended up eating at Nice House Restaurant. 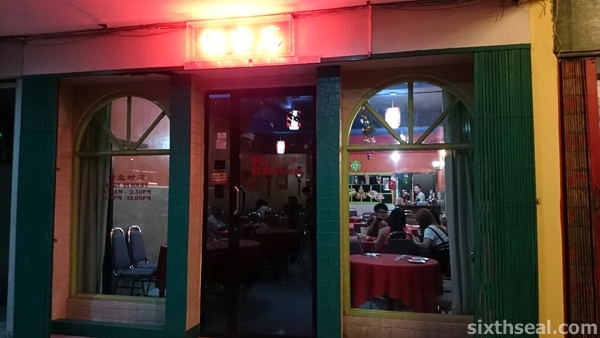 I’ve been here a couple of times before and it seems that their typical Chinese cuisine has changed into something which I’ll call quasi-fusion. 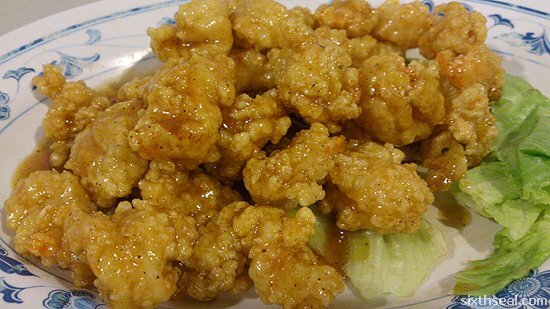 It’s still Chinese food but it uses much more non-traditional ingredients to cook. 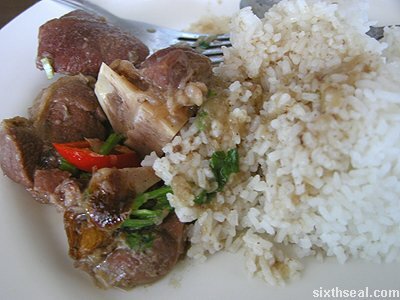 The black pepper lamb was really good too – the meat was tender and juicy, and it goes very well with rice. 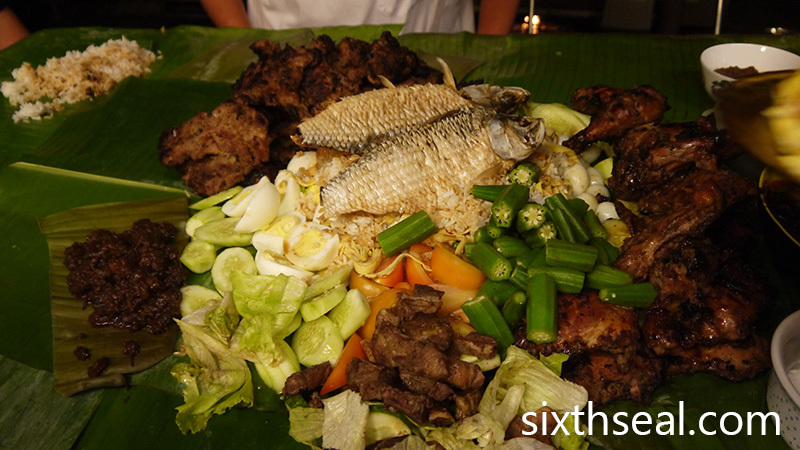 A superb dish which wasn’t as sweet as the prawns (coz it didn’t use honey). 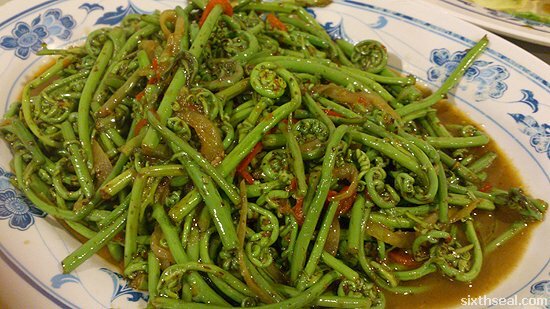 We also ordered midin cooked with sambal – it’s a wild jungle fern that’s very popular in Sibu but hard to find anywhere else. It’s our vegetable quota. 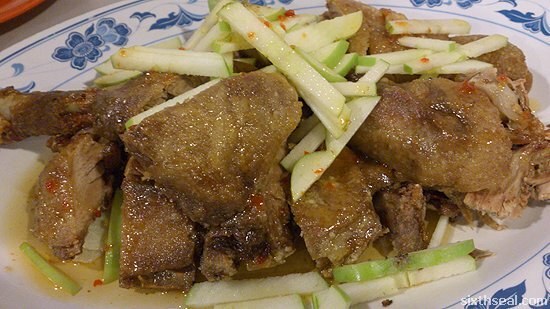 I felt that the apple duck was the most interesting dish during dinner. 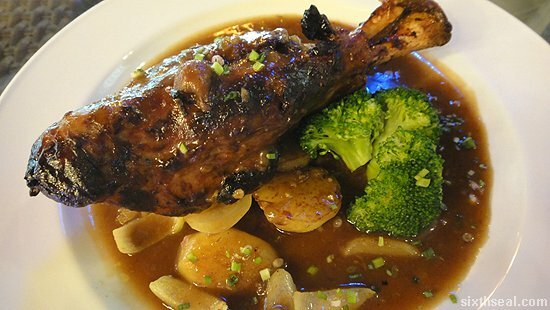 We ordered half a duck since a lot of people don’t eat duck due to the gamey taste but both of us do and we have been rather deprived of this particular fowl. I quite liked it although I think Arthur didn’t enjoy it as much. 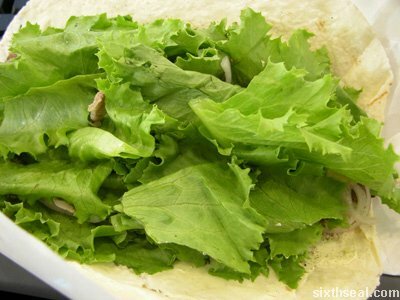 He hasn’t tried it before so we ordered it and the two of us finished everything – right down to the lettuce and green apple slices. I think a lot of people thought we were having a major argument coz when the time came to pay the bill, both of us stood up and insisted on settling it. It must have looked quite interesting since I was blocking his way to the cashier. Heh. I returned to Tom’s Too for lunch a couple of days ago with a friend. She hasn’t been there before and I wanted her to try the food here. 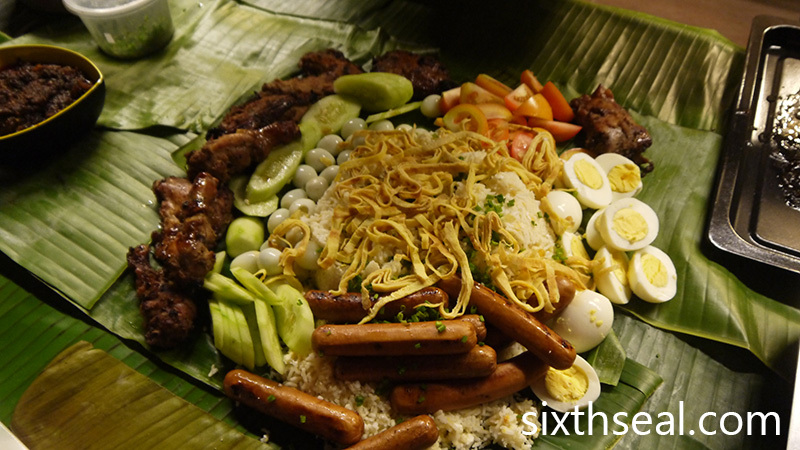 It’s just my second time eating here too and I was eager to check out more of their offerings. 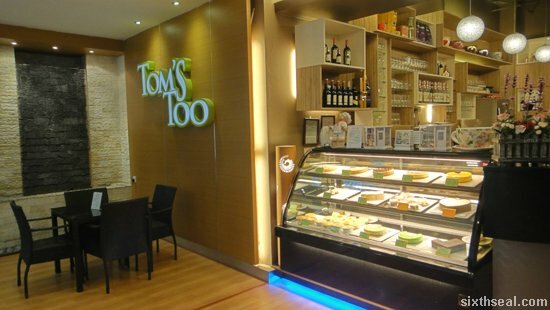 Tom’s Too has a range of Italian sodas and I asked Charles (one of the best waiters there – speaks good English and friendly) to show me what they were made of. It’s apparently just syrup from a wide range of flavors mixed with soda water. 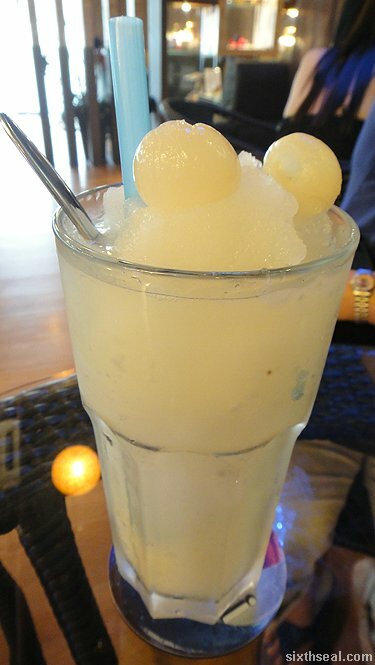 My friend has Tom’s Freeze (RM 9.90) – a house specialty concoction that features lychees as its main ingredient. She said it was good. I don’t know, I don’t like lychees. You know those old Chinese banquet dinners that serves lychees with peaches in ice as dessert? I only ate the peaches. 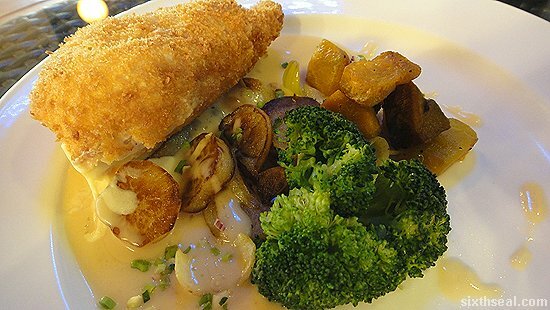 We both shared the recommendations for mains – she has the Chicken Cordon Bleu (RM 27.50) which was quite good. The chicken was done well and has a slice of ham inside and lots of oozing cheese. 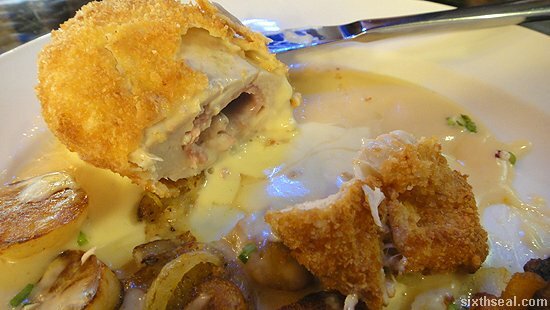 They used breast meat – Chicken Cordon Bleu is supposed to use boneless breast meat – not exactly my favorite cut from our favorite poultry but I rather enjoyed it. I’m pretty sure I ate more than my fair share. …not ordering a side of mashed sweet potatoes. Arthur did that – it’s not on the menu but apparently you can ask for it from the chef. I shall endeavor to do that next time. The gravy is slightly sweet so I’m sure it’ll go very well with mashed sweet potatoes. 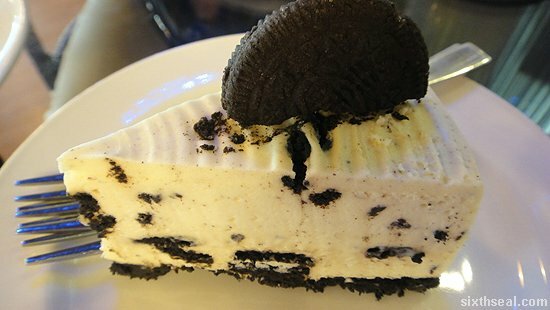 Dessert was a slice of Oreo cheesecake (RM 11.90) from their counter deli. 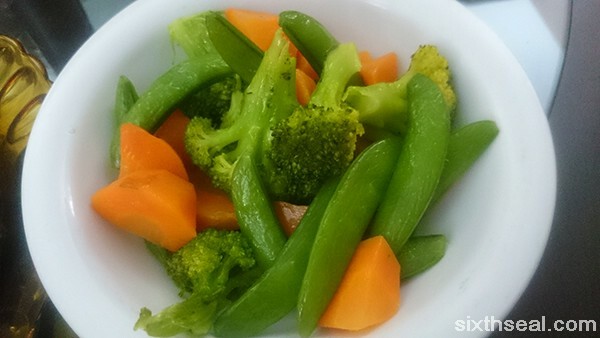 It’s pretty good for Sibu standards, but I wouldn’t write home about it, I’ve had better. to get done. I wasn’t hungry anyway, so I just figured I’ll skip lunch. 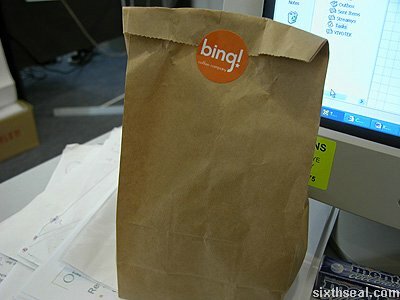 However, Bernice came in with a paper bag from bing! 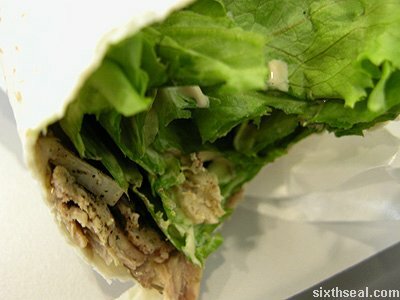 She bought me a lamb wrap from bing! 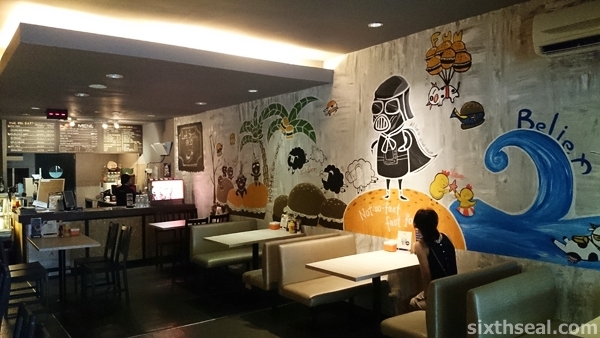 the coffee shop that everyone seems to like in Kuching. 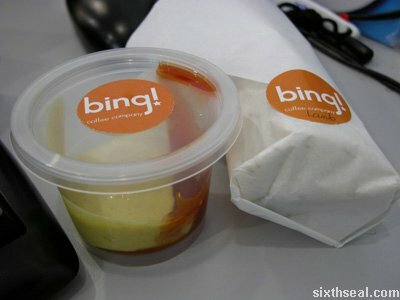 The lamb wrap comes with a small tub of sauces – mustard, chilli and mayonnaise and the familiar orange bing! sticker. outlet which caught my attention when I went past during lunch hour. 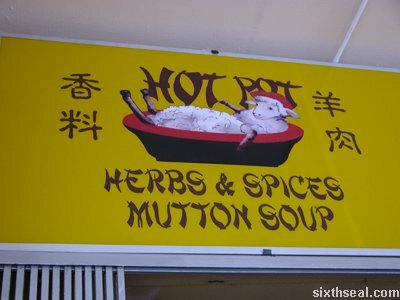 their mutton soup just because I liked the sign board so much. 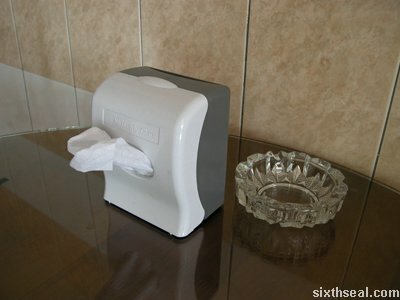 seeing any unsightly metal flimsy ashtrays or tissue boxes over here. about 30 minutes for mine to arrive. 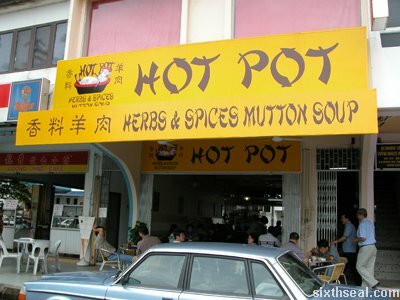 Hot Pot Herbs & Spices Mutton Soup. i’m lovin’ it. the plastic containers flanking the bottom left of this photo. neither have I, there is no spoon) so I had to pass this one by. and then picked up the meat with my fingers and eat that. Doh!